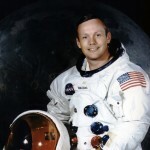 Armstrong attended Purdue University and earned a Bachelor of Science degree in aeronautical engineering in 1955. The Korean War interrupted his education when he went to fly 78 combat missions F9F-2 jet fighters. He was awarded the Air Medal and two Gold Stars. After the war he continued his education at the University of Southern California, where he earned a Master of Science Degree in aerospace engineering. Joined the NACA (National Advisory Committee for Areonautics, later became NASA) in 1955. He transfered to the NACA’s High Speed Flight Station at Edwards Air Force Base (now NASA’s Dryden Flight Research Center) later that year. He served as a aeronautical research scientist and pilot. As a research pilot Armstrong flew the F-100A and F-100C, the F-101, and the F-104A. Other planes he flew included the X-1B, X-5, F-105, F-106, B-47, KC-135, and Paresev. He had a total of over 2450 flying hours by the time he left Dryden. Before it was cancelled Armstrong was a member of the USAF-NASA Dyna-Soar Pilot Consultant Group. He studied the X-20 Dyna-Soar approaches and abort maneuvers using F-102A and F5D aircraft. Armstrong was a part of the X-15 program from the beginning and was involved in both the piloting and engineering aspects. He made seven flights in the X-15 rocket plane between December 1960 and July 1962. 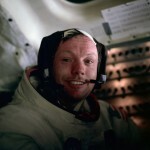 He reached the altitude of 207,500 feet and the speed of 3,989 (Mach 4). After being selected in the second group of NASA astronauts in 1962, his first space flight was aboard Gemini 8 with Dave Scott. Gemini 8 conducted the first ever docking in space, but shortly afterwards the spacecraft began spinning out of control. Undocking from the Agena target only made the spinning worse and the spinning was nearing the point where the astronauts might pass out. Armstrong decided to shut down the reaction control thrusters and regain control using a second set of thrusters only intended for re-entry. This required that the mission be cut short and they splashed down in the contingency recovery zone in the western Pacific Ocean. 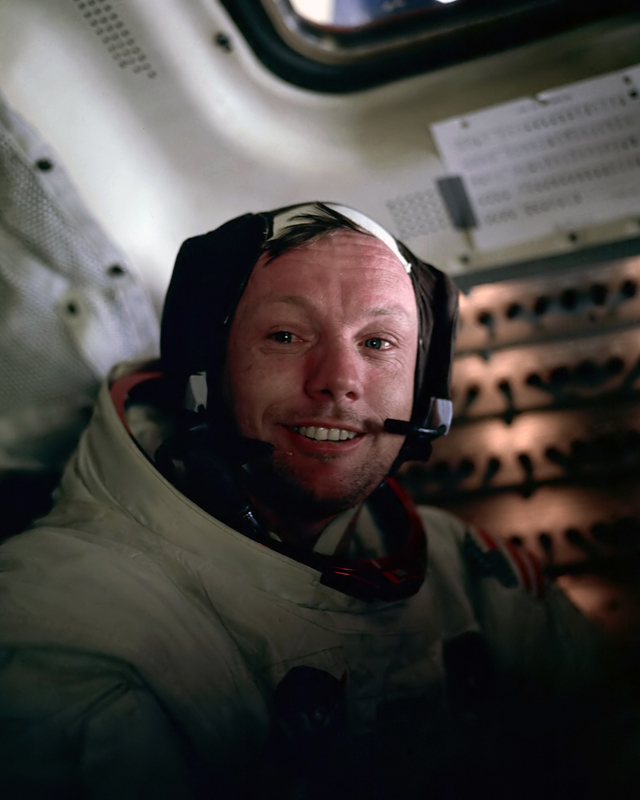 It was Armstrongs actions that prevented his and Dave Scott’s deaths… and ultimately resulted in Armstrong being named Commander of Apollo 11. During the Apollo 11 mission Armstrong became the first human to ever set foot on the Moon. His first words were “That’s one small step for man… one giant leap for mankind.” He was joined shortly afterwards by Edwin “Buzz” Aldrin and together they spent over two hours on the lunar surface. 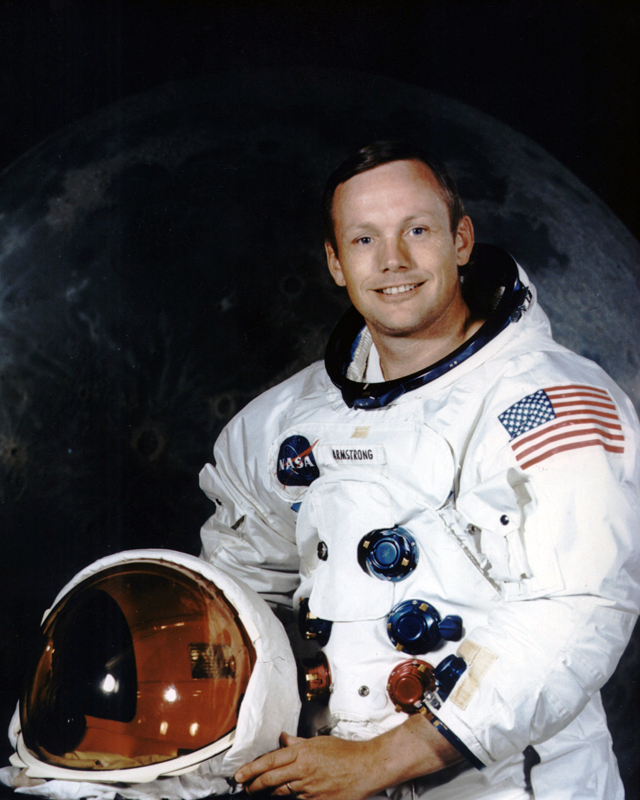 After the Moon landing, and the world tour that followed, Armstrong became the Deputy Associate Administrator for Aeronautics at NASA Headquarters. He left NASA in 1971 to become Professor of Engineering at the University of Cincinnati, a post he held until 1979. He has been on the board of a number of corporations including Cardwell International Ltd. (1980-1982), Computing Technologies for Aviation Inc. (1982-1992), Eaton Corp. (1981-1999), and AIL Systems Inc.
From 1985 to 1986 Armstrong served on the National Commission on Space, a presidential committee to develop goals for a national space program into the 21st century. He was also Vice Chairman of the committee investigating the Space Shuttle Challenger disaster in 1986. During the early 1990s he hosted an aviation documentary series for television entitled First Flights.